The first thing that I did was to apply the very informal "thumbnail test" on both the GA LHP and Remington's, since I have plenty of it on hand as a "carry load" in .38 Special revolvers. 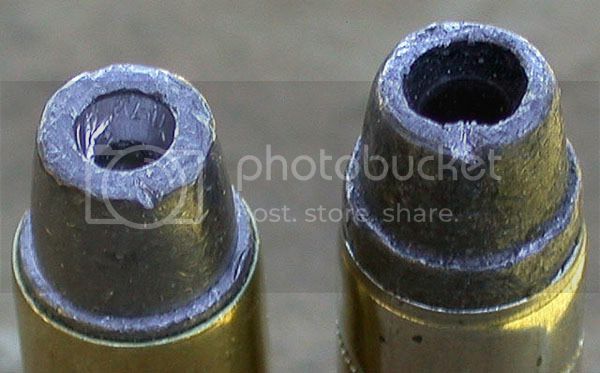 The lead alloy on the GA load (left) felt quite a bit harder than the Remington. You can easily see the thumbnail indentions on each bullet. I didn't shoot this into any test media on this range visit but I'll bet that if it expands, it will be from 3" and longer barrels. 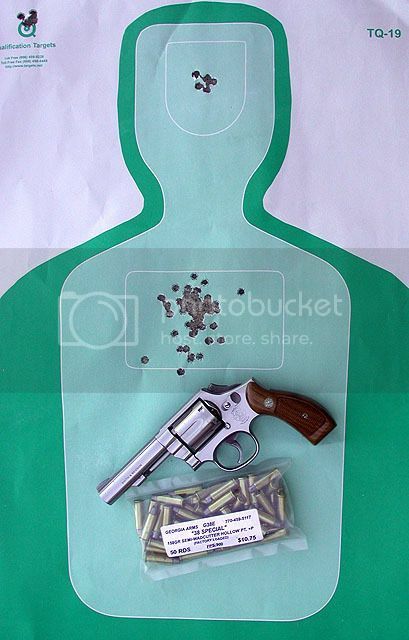 Ten shots fired over the chronograph approximately 10' from the screens yielded an average velocity of 871 ft/sec, not exactly 900 ft/sec as advertised but close from a 4" .38 Special S&W M64 revolver. Standard Deviation was 16 ft/sec. I am not sure what bbl lenght GA uses for their testing but even if a 4", it is common for two different barrels to yield two different velocities with the same load. This is close enough in my opinion and I see no trumphed up or "optimistic" advertising. Using a pre-owned-probably-a-police-turn-in S&W Model 64 set up for double-action-only shooting, the GA load provided plenty of accuracy, at least for my needs. The 6-shot group at the upper left of the target was fired standing (two-hand hold) at 7 yards. The "head shots" were fired the same way at 10 yards. The group in the torso was fired at both 15 and 25 yards. I am well satisfied that removing the human error (me) in any of these grops would have significantly shrunk them. While none of this was slow-fire, neither was it a maximum effort at speed. (The "fastest" shooting was at 15-yards and estimated at about 1 shot/sec.) I wanted to see how this warmer load handled and if it might make a somewhat reasonable practice load for folks who use the 158-gr. LHP +P from Remington or Winchester (think Federal may have discontinued it) and don't reload their own. In my opinion, it does with regard to felt recoil; feels like the Remington load to me, but felt recoil is subjective, too. It is not inexpensive, at least to me, but it does cost less than factory new LHP +P ammunition. The last box (50) Remington's cost me $37.00 and change! Fifty of the GA 158-gr. LHP +P cost $10.75, at least at this time. Handloaded ammunition for those already set up to load .38's would cost less but some folks simply don't reload. As mentioned earlier, I do not expect this stuff to expand from barrels less than 3" but don't know that for sure. Eventually I'll get around to running some informal expansion tests on it but does this mean that it is "useless" as a defense load? I think not. I suspect that it should work about as well as SWC in the 900 ft/sec range but I see it mainly as a practice load for those using 158-gr. +P ammunition for carry but don't reload. As might be expected, they are flooded with orders since Nov. 5th. I think it shows that this ammunition has remained pretty darned consistent. I load 158 SWCs in my Mdl 60. Expansion is short barrels isn't a bet I'd like to cover, so I kinda lean toward blunt 158 SWCs at std velocity. Other feather/air weight J frames are loaded with JHPs.